You must make reservations at least 5 minutes in advance of the time at Wildebeest. Metered street parking is available on West Hastings Street, as well as on Abbott and Cambie Streets to our west and east. A secure pay parking lot is available for guest use across from us at the intersection of Hastings & Abbott. 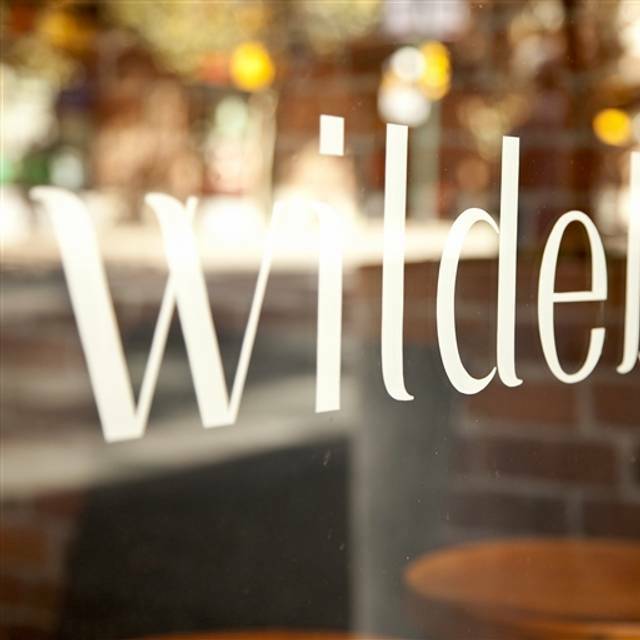 Wildebeest (winner of Best New Restaurant and Best New Design - 24th Annual Vancouver Magazine Restaurant Awards) invites you to experience deliciously decadent yet simple country cooking. Explore a farm-to-table menu paired with a diverse selection of Old and New World wines and a carefully crafted cocktail list. Set in a refurbished 19th century building, the multi-level space offers a front house cocktail bar & lounge, open-concept kitchen, an inviting dining room with banquette seating, and an intimately-set private dining room. The menu focuses on delicious local ingredients prepared with integrity. Every component has been thoughtfully nurtured by executive chef, Ian McHale, from field to finish. We work closely with surrounding farms and farmers to organically raise healthy, happy animals and grow custom produce. Employing classic butchery traditions and contemporary techniques, Wildebeest presents delicious menus of the season. This is food for food lovers. Private events and dining are welcome at Wildebeest, in the restaurant and Underbelly, the private dining room downstairs. The restaurant has capacity for events up to 100 guests, and Underbelly is a perfect venue for groups up to 55. Join us by booking either room or both! Overall food was outstanding, but the bar and table service totally let down the kitchen. Was it because it was Easter Monday and the bar manager just didn't care to be there? Was it the timing of our table server and did he just feel overwhelmed because there were actually a few tables more than anticipated? I may come back on a whim but as a world traveler who dines out any day all over the world, this dining experience was spoiled by uninterested mediocre service. They need to match the service to the outstanding food because it matters. Parents were in town so I wanted to take them somewhere unique and tasty and Wildebeest did not disappoint. 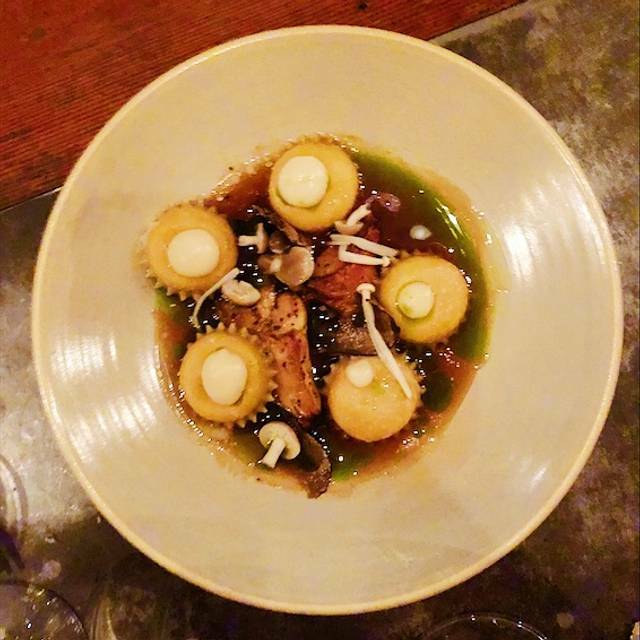 Incredible food, great drinks, and amazing service. Would happily recommend. Three of us went to Wildebeest for brunch on Good Friday. The dishes were delicious, the service was great and the atmosphere was lovely as always. It was fine, but the menu has become a bit tired. Birthday party. It was awesome. Service was exceptional!! Sell your kidney for this meal. It's that good. One of the best spots in Vancouver. Excellent food and service. Definitely an indulgence (we did the $70/pp chef's selection, you can go less per prob through) and thought everything was amazing and well worth the price tag. Service was also excellent! We had a most enjoyable evening with great food. Will return! Wildebeest never disappoints, which is why I keep coming back here. The service is always great and the food is amazing. Highly recommend! We were a party of 5 and decided to do the “Omakase” or “Chef’s choice”. We started with drinks off of the cocktail list and every single one was amazing. The food followed soon after our drinks arrived and what we thought was just going to be dinner soon turned into one of the greatest meals of our lives and that is saying a lot. EVERYTHING was excellent!!!! I still have certain flavors in my mouth and on my mind. This restaurant is beyond special. Just go there and eat!!!!! I would recommend getting the chefs tasting menu. This will have the freshest food and specials they are currently doing. Interesting delightful food. The food and service was absolutely amazing. I would definitely recommend going with the omakase and letting them order for you. They were spot on. 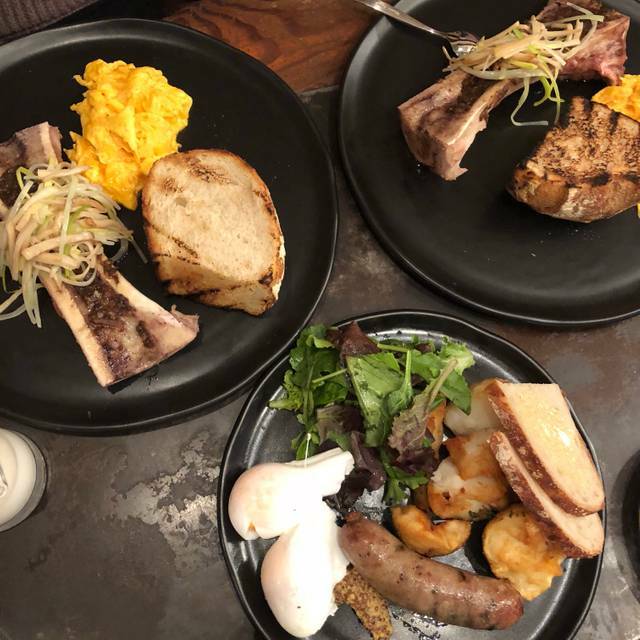 Usually I find brunch to be mediocre, like I could do better at home, but everything was cooked beautifully at our whole table. 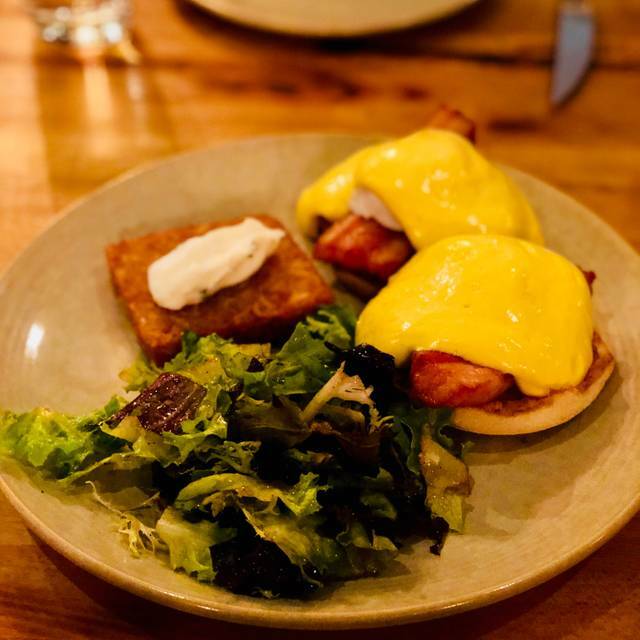 The coffee was strong, OJ was fresh, not to mention one of the only places you can make weekend brunch reservations. Zero complaints about service. Will definitely be my first choice next time. Ambience is so relaxingX service is very friendly! Flavours of their foods amazing. However, was quite disappointed with the quantity of the food. So little for such an expensive amount. The food was excellent, however the service was extremely lacking and tainted the whole experience for us. We had more interactions with food runners than with our actual server, and had to wait 20 mins until after we finished our appetizers before someone even came over to ask what we wanted for our main course (was not our server, seemed like a manager). The night ended up being very long and drawn out, with empty plates and drinks sitting on the table and way too much time in between courses and drinks since the server was completely absent and we weren’t able to order when we were ready to. (I have to note that the server wasn’t busy, I would have been more understanding if she had been, however we could see her most of the night casually strolling in circles like she was bored). The food was really delicious, however very costly for the small portions and I feel that there are many other restaurants in the area where you can enjoy a much better dining experience. Also the chairs are really terrible. I understand the trendy decor, it is very beautiful inside, however the chairs were these tiny hard stool like things that wobbled and dug into my back in such a bad way. I’m a very petite person and I felt like I was going to break that chair. Please get something more comfortable for your guests. Each of our servers were great, but the blonde with the slicked back hair was superb. Gave us a recommendation for after our event that was spot on and amazing! It’s just too bad he wasn’t there, we wanted to thank him. 😜 amazing food and fun spot! Portions for money spent was not great. Quality of the ribeye was not great. Solid third was fat and gristle. Service was lacking around our drinks? But fine with food. Good experience in the past, less so this time. We arrived a tad early for our reservation and were sat immediately. The staff were all super friendly and helpful. The waiter recommended a pinot noir barrel aged cider, and that was fantastic. We also opted for the omakase which is when the staff and chefs decide what you'll eat for you - kind of like a trust fall. We gave them a budget and they delivered dish after dish after dish that met our dietary needs. As vegetarians, we essentially ended up with exactly the handful of vegetarian dishes on the menu. Eight courses and seven of those courses were MAGIC. We moaned our way through each one. The cheese plate with the fig reduction, homemade mustard, sourdough crisps, pickled potatoes, and berries set the tone. Each bite made us pause and sigh and savor. The grilled bread and butter made a nice compliment, as well. The heirloom vegetables were packed with flavor. The cayenne maple granola brought a sweetness and crunch that completely balanced the sours of the pickled vegetables. The pumpkin was amazing. Beets never tasted so good. Next, the sunchokes on their own would have been good, but pairing the sunchokes with the chanterelle butter and the sweet moist cornbread created a rich, deep stick-to-your-bones bite. The stinging nettle ravioli is positively bursting with creamy red cow cheese and dressed with some compressed Swiss chard and a sweet vinegary sauce, including drizzles of spruce oil. Popping a ravioli in your mouth and letting the very rich umami of the cheese ooze out was delectable. Sadly, all night I was so excited to try the pasta with the burrata because... burrata. But this was the only dish that disappointed. Utterly unbalanced, it was completely and totally overrun by the smoked olives to the point that NOTHING could be tasted but the way way way way overused olives. A few bites of this left us so glad we'd had all the other dishes first. If that had been our only impression, we would never have come back. Great place with character. This was a business dinner and we would love to go back soon. Fantastic food, fantastic service. Definitely recommend to anyone, and I'll be coming back on my next visit to Vancouver. Food was fantastic and the ambiance is perfect. We had starters and mains and they were all fanatic. Super impressed with the charcuterie board. And the poutine was great. Omakase for two still left us a little hungry and we are small people...otherwise splendid. Great for breakfast. We were quickly seated and our food arrived promptly. Only complaint is that our sour dough bread was over toasted. 3rd time at Wildebeest, and it never disappoints. 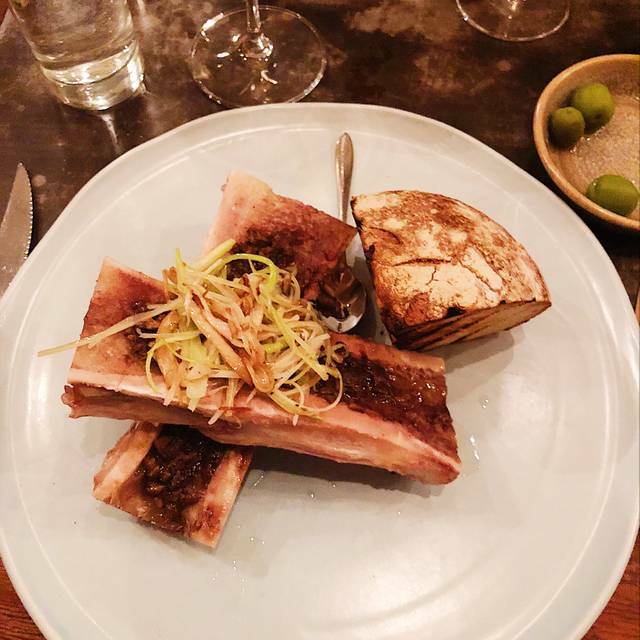 My friends from Texas were even super impressed with the tasty, smoky cornbread, and enjoyed their first bone marrow luge. Food was really well thought out—flavourful, a little on the rich side but the portion sizes were perfect for balancing this. Service was attentive but not hovering (servers always seemed to appear right when needed). Overall a really great experience for our first night out in awhile. The milk & lemon dessert blew us away! The food was absolutely incredible. 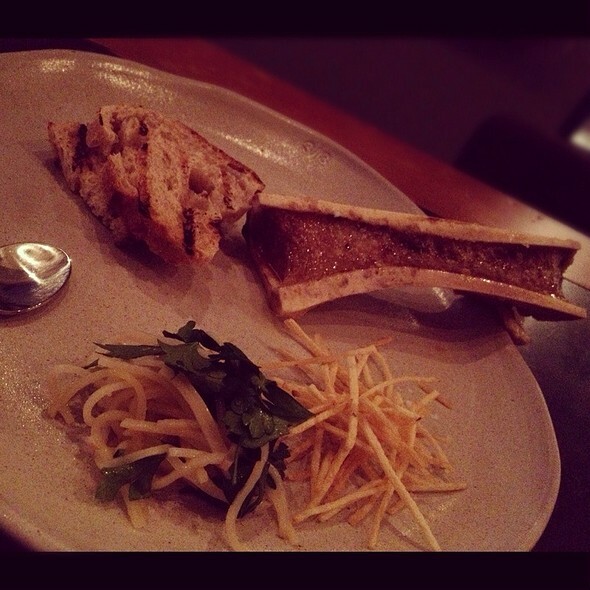 Our favorite was the bone marrow followed by a sherry louge! 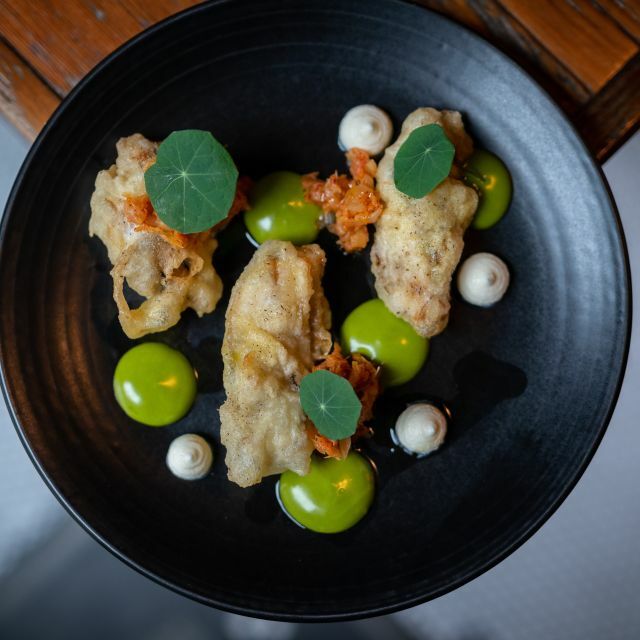 Wildebeest consistently put out great sharing plates which are both imaginative and tasty. Their service is top-notch without being fussy and this trip was for my 9 year old's birthday - it's his favourite restaurant. The staff were very welcoming and were fabulous to him - and he even got a candle on dessert and had a chat with the chef. We hope we will be celebrating there for many years to come. Brunch with colleagues are always a joy in this great space with excellent service and fantastic fare. Bartender is one of the best in the city. 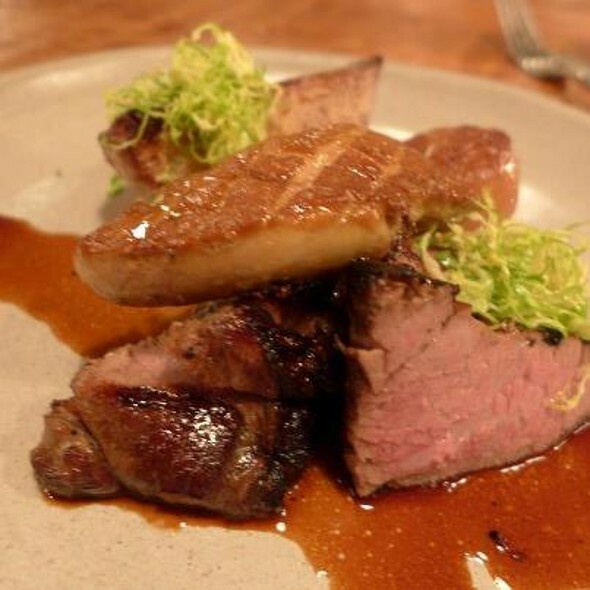 A true artist to complement the most creative and delicious meat-based menu in the Vancouver. I looooooved the Ardbeg old fashioned, extra smokey just the way I like it! Also the food was incredible - definitely go with the chef's omakase! Excellent service too! Fantastic service, we chose to “trust the chef” for our late Valentines dinner and it was wild. Cocktails were amazing, all of the service staff are knowledgeable and friendly, and every dish was perfectly built. Thank you for everything! It was a nice dinner, lovely ambiance. Our first time. 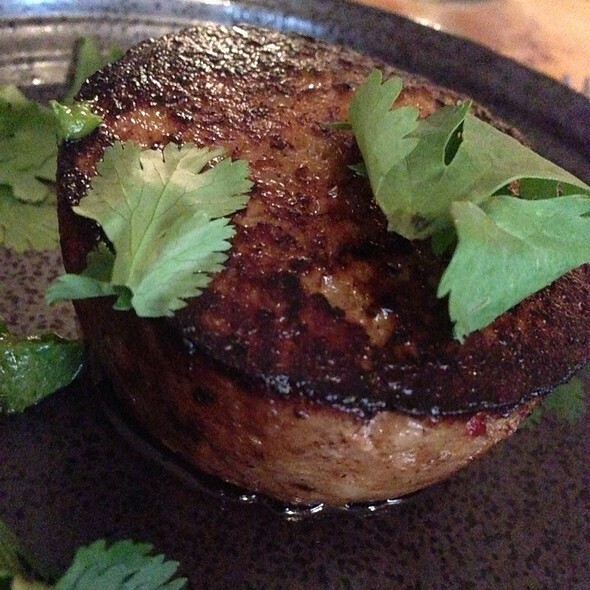 I ordered the pork belly, which I love, usually. Two of us at the table ordered and everyone tried it. We all agreed that the sauce was not very pleasant and tasted like something out of a bottle. We enjoyed the chicken and bison. Husband says he would go back. I am not sure... Music was loud at the back, but the ladies turned it down for us. We were right under the speaker. Loved this restaurant! As a former Lead Concierge at the Four Seasons, it would be pretty high on my suggestion list. The food and service was amazing and I was very impressed by the overall knowledge of the servers. However, as a dining guest, I would suggest they rethink their music selection as quite a few songs where super inappropriate and made me (30 year old male) super uncomfortable. It was excellent. We had a chef’s menu. So good!! !